A Cease and Desist (C&D) is a letter demanding that someone stop doing something, or face legal consequences. For fans, this most often means a letter sent by a legal representative of a corporation, demanding that the fan shut down a fan website, remove fanfiction, remove fanvids, remove images, etc., that the corporation believes infringes on its rights. Since most fans don't have the financial means to risk a court case -- and may well agree that their work was infringing, even if not maliciously meant -- C&Ds are usually obeyed. Fan sites/fanworks come down, either permanently or to be moved quietly to a new location, possibly under a different name. 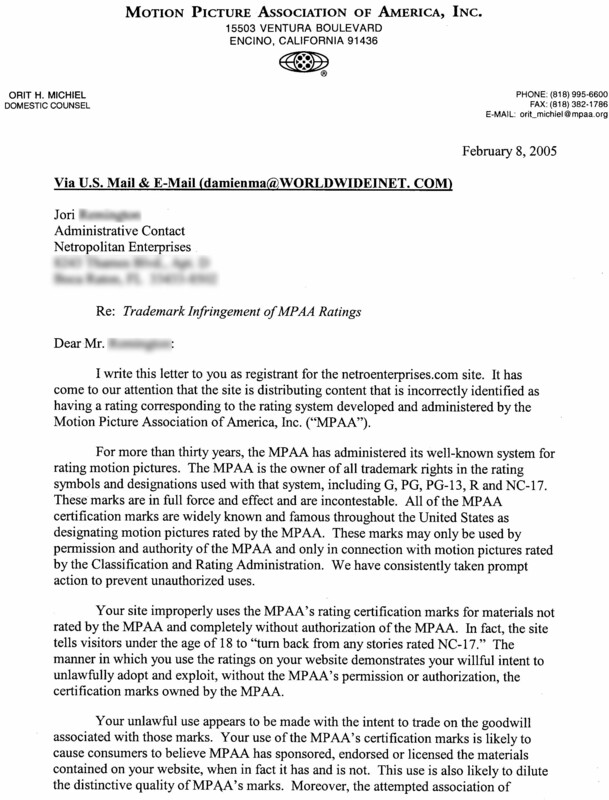 More recently, U.S. corporations have also begun turning to DMCA notices sent to U.S.-based ISPs and webhosting companies, who are obligated by law to comply and remove or block the "infringing" content without investigating any further -- the default assumption is that any DMCA claim is legitimate. It's then up to the fan to contest the claim (assuming they even find out who submitted it), which again, most fans don't have the resources to do. Mercedes Lackey previously allowed fans to write fan fiction in her Valdemar universe only if they signed a release form and only if the fan fiction was not posted online . More recently, she has announced that fanfic in her original worlds is permissible under a Creative Commons license. In 2007, Funimation sent C&D letters to two fansub groups working on Gonzo's RomeoxJuliet. Both groups complied. This was the first publicized C&D sent to a North American fansub group while an anime series was still airing in Japan. There are organizations to help fight inappropriate C&Ds. The Organization for Transformative Works, a nonprofit fannish endeavor, has a legal committee that will listen to any fan who's received a C&D or DMCA notice, and will connect them to other organizations that can offer direct help, such as the Electronic Frontier Foundation. The Electronic Frontier Foundation, while not specifically fannish, is dedicated to protecting online civil liberties. ↑ Worlds of Mercedes Lackey - News (bottom of page) Accessed March 14, 2010. ↑ carissa_lynn received a C&D letter for the use of MPAA ratings on Time Turner.net. Copy of the original c&d letter at her LiveJournal, posted 20 March 2005 (accessed 14 Mar 2010). Also posted at at Lumen (formerly Chilling Effects). ↑ Gonzo Halts Romeo×Juliet Fansub with FUNimation's Help posted Sept. 28, 2007. Accessed Nov. 25, 2012. ↑ Romeo x Juliet "To my knowledge this is the first occurence of Japanese company actually sending a C&D during an ongoing anime" posted Sept. 27, 2007. Accessed Nov. 25, 2012. This page was last modified on 21 October 2018, at 12:01.